Lead author of the study Associate Professor Adam Stow from the Department of Biological Sciences said future conservation efforts need to mitigate threats outside of protected areas and consider the impact of recreational diving, fishing and the use of shark nets. 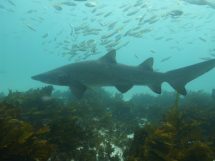 “Accidental capture of grey nurse sharks occurs outside the existing protected areas, and in addition to direct mortalities from capture and stress, many sharks are found tangled in fishing gear which can cause delayed fatality from punctured organs,” said Associate Professor Stow. “This is the first estimate of the effective population size, or the number of breeders in the population, and reveals an alarmingly low number of sharks left.